Thank you Western Union for sponsoring this post. Do you have a favorite meal or story that brings you home? Share your memories with #WUHomeCooked. Food is something that brings people together and connects them. I was watching this Western Union video and it really got me reminiscing for our time in Uruguay. In the video, Western Union surprises some of their customers with a favorite meal from their home culture from their families. Many of Western Union’s customers are here in the US from another country working to make a better life for themselves and their family. They use the Western Union service to send money back to family in their home countries. Even though they’re living her in the US, most of these people deeply miss their home country and culture, so this surprise was a way of giving back to their customers, who they see as quiet heroes. When we spent a year in Uruguay, we experienced a lot of the same sentiments. Food was a huge part of our daily lives. We were between two cultures. We wanted to immerse ourselves in the Uruguayan culture, but we also missed some of our favorite things from the US. We quickly became known as foodies in the Expat community. Not only did we write a lot about our experiences at restaurants on our blog, but we actually wrote a cookbook for Expats. The cookbook was full of recipes for items we were used to having in the US, but couldn’t find in Uruguay. Simple things like sour cream and ranch dressing were difficult to find, so we made our own. It was also hard to find good Mexican food or Chinese food, so we started making it ourselves. It’s amazing how much you miss certain things when you leave your culture behind and immerse yourself in another culture. While we were in Uruguay, we grew to love Uruguayan food. Food grilled over wood on parrillas was a way of life. All of the food from the Uruguayan culture is very simple, but very good. And the grassfed beef was amazing (and cheap too). Our younger daughter Kaylee, was born in Uruguay, so we want to keep part of that culture in our family. When she’s older, I’d love to take her back and show her where she spent the first 4 months of her life. After watching that video, I decided to make one of our favorite appetizers, beef brochettes, from the restaurant we frequented most often, Rocco Resto. While I definitely cannot replicate the delicious meat grilled on a parrilla, the chimichurri sauce brought me back to our time in Uruguay, and it gave the girls a little taste of the culture too. Finely mince all of the ingredients and place them in a bowl. Mix in the olive oil and red wine vinegar, then transfer to a pint sized mason jar in the refrigerator. Allow the flavors to meld for at least a few hours before serving alongside your favorite grilled or roasted meat. 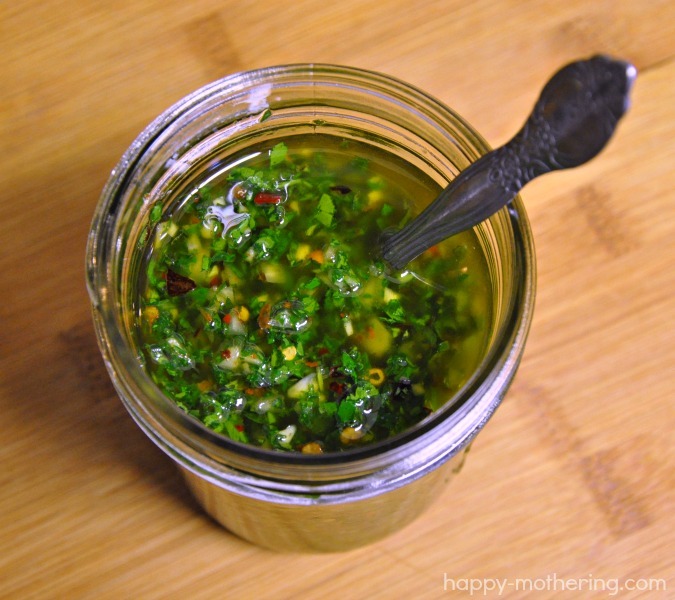 Chimichurri sauce can also be used as a marinade. It’s a simple, delicious and versatile sauce. Have you ever spent an extended amount of time away from home? How did food play a role in your time in another culture? This sauce looks like it would make almost any meal taste better! YUM!